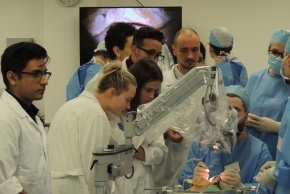 From 20 to 23 November 2018, the second year of the EANS Hands-on Cranial Cadaver Course for Young Neurosurgeons was held at the Anatomical Institute of LF MU. Following the success of last year, the European Association of Neurosurgical Societies (EANS) decided to organize these courses regularly in Brno. 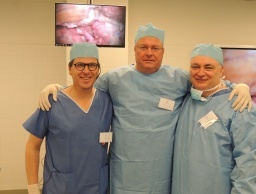 ogistics of the course is provided by ECPA (Educational Center of Practical Anatomy), a professional guarantee is given by Prof.MUDr.Martin Smrčka, Ph.D. and Neurosurgery Clinic of Brno University Hospital and Chairman of the Training Committee EANS prof. Torstein Meling from Geneva. 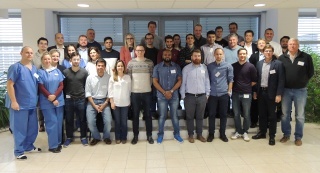 The course was attended by 20 students, young neurosurgeons from many European countries, as well as Turkey and 10 lecturers, of whom five are from the Czech Republic. Students work in pairs at ten stations with cadaverous heads, fully equipped with neurosurgical instrumentation including microscopes. 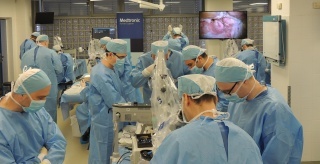 The main theme of the course is the study of basic neurosurgical approaches to nitrous cells. The course was again very good and another continuation is planned in 2019.